Take Up the Challenge and Try Our Facilities! Are you tired of unfriendly gyms, impossible fads and programs which take time and money while never producing results? Look and feel better than ever with 6-Week Transformation from Innovative Fitness! Does it seem like no matter how many programs you try or how many exercises you perform, you just can’t lose any weight or bodyfat? Do you feel like you’re out of motivation and out of time? Do you want to get into the best shape of your life while becoming healthier, more active and more energetic? My name is Dusty Kinley, and after nearly a decade working in the big box gyms, I was as fed up as most of the clients were. I wanted to create something different, and something better, which is how Innovative Fitness was born in 2007. Innovative Fitness is dedicated to giving our clients the best possible experience and results. You’ll enjoy effective and innovative workouts tailored to your specific needs and goals, and you’ll also enjoy a positive and supportive community. Consider our facility your home away from home. We’re all about amazing service and a friendly environment. We want to get you into the best shape of your life, while also being the best part of your day, each and every time you come for personal training or boot camp. We’ll ensure you stay motivated and committed, and you’ll see that you’ll also thrive in an environment where everyone pulls for one another. There’s no magic pill or instant cure for fat loss and fitness — you’ll need to work hard, and we’ll show you exactly what you need to do to succeed. Whether you have never worked out before, or you’re fed up with ineffective programs, we’re dedicated to your cause, and we’ll help you reach your goals. Be healthier and more energetic… look and feel better than ever! Change your life with Innovative Fitness Personal Training & Bootcamp! We’re called Innovative Fitness for a reason! Experience the difference that the best trainers and the best community can make for you. Team training with unlimited access to high-energy group fitness coaching sessions. Proven nutritional strategies for fat loss and fitness success, guaranteed! At Innovative Fitness, each person who attends our personal training or boot camp becomes a member of the team. We’re all pushing for one another, and everyone stays on track and grows stronger and more fit as a result. You’ll be amazed at how great you look and feel, how much energy you gain, and how much healthier you are. Training with us will get you into great shape, of course, and it will also provide an all-around great experience which will help to change your entire life. Try us out for 6 weeks and we know you’ll want to incorporate Innovative Fitness into your life for the long term. Please ask us about our next 6-Week Challenge Program! I know how frustrating it is to feel trapped. Like you don’t have the time, the energy or the motivation to succeed. You’ve tried things in the past and nothing has worked, and you’re hesitating about trying something new. At Innovative Fitness, you’ll enjoy an entirely fresh and unique approach to fitness. Exercising, losing weight and increasing strength can all be fun. You can do it in a friendly environment, with trainers who are as committed to your cause as you are, and a team atmosphere and supportive community who are all helping you to reach new heights. The new you is waiting around the corner….so what are you waiting for? We don’t have a magic pill for you to take, but we guarantee that when you give Innovative Fitness a chance, you’ll improve your health and your fitness, you’ll look and feel better than ever, and you’ll finally overcome all of those challenges and struggles from the past. PS. With our expertise in fitness and nutrition, there’s absolutely no risk, and nothing to lose — except all of that stubborn body fat! The time to change your life is now. Sign up and we’ll be looking forward to seeing you at Innovative Fitness soon! Check out what some of our clients have to say below! "Meet Steve Stone our 2013 Fitness Transformation Challenge winner. Like you Steve began his weight loss journey about 2 years ago tired, run down, no motivation, low energy, health concerns and achy joints. Steve is a quiet guy, extremely hard worker, runs his own business and you guessed it sits at a desk all day. Over the course of the first 6 months Steve would lose about 30 lbs. One thing Steve didn’t lose in the process was some of his bad habits. Over the next year Steve would go back and forth eating healthy one day to eating worse than ever the next. It seemed like the harder he tried the worse it got. Steve stayed dedicated to his workouts but continued to struggle with his weight adding back on about 20 lbs. Finally Steve had enough in January he decided to join the Fitness Transformation Challenge. This time he was All-In, committed, more motivated, changed his eating habits and consistently worked out 3 to 4 days a week. 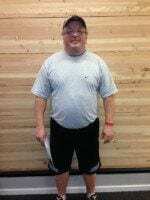 Steve lost 34 lbs and 6 % body fat in 8 weeks. In the process he found a workout partner his daughter who has helped motivate him and hold him accountable. The two of them can be seen every Wednesday, Thursday and Saturday. Along with Steve’s weight loss he has more energy, motivation, improved health and his joints feel great. 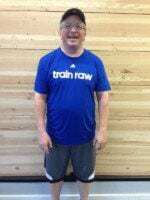 We would like to congratulate Steve and his trainer Jason for a job well done." "I started in April of 2008, have been coming to IF regularly for 5 years. I love going to Innovative Fitness. The hour I get with my trainer is often times the best part of my day. All of the trainers are positive and encouraging, and push you to work your hardest. There is a supportive attitude from trainers and clients alike, which is different from any other gym I have gone to. Dusty has helped me with training for a marathon as well as helping regain strength and mobility after surgery. I look forward to attaining new goals with him in the next year. I love the supportive attitude and atmosphere. The clients get to know each other, and all of the trainers get to know all of the clients. It is friendly, warm and not intimidating in the least. I like that the trainers are well-educated and care about continued education. I feel like they are all highly skilled and trained." "I started in July of 2011 and have been training with Dusty twice a week since then. My experience at Innovative Fitness has been life changing. I have lost 63 pounds, gone from a size 16 to a size 6, I started with a body fat percentage of 43% and am currently at around 29%. I have been encouraged, pushed to do things I never thought I could do. I cannot express how much I appreciate Dusty and the whole Innovative Fitness family, I feel like I have my life back. I feel like I am part of a family. Dusty and all the other trainers care about how I am doing. I also like that the training is always challenging, Dusty is always encouraging me to give 100%. I also like boot camp on Saturday mornings; it gives me a chance to exercise with friends and family in a non-threatening environment." I was really stepping out of my comfort zone, having never been an athlete or regular exerciser. Immediately I found a very personal & professional team ready to start empowering me to lose weight , body fat and increase my fitness level. I never felt judged—–only patiently guided to work toward my goals a step at a time. Now I have lost body fat, inches, pounds, and gained confidence, balance, strength and an overall feeling of improved health. There is still as much “mental work” for me as physically exercising! My personal trainer has kept me “in the game” and gotten me to a place I NEVER would have imagined. Community—-I like the greetings & encouragement from all the staff. The atmosphere has the “vib” that every one fits in, whatever their fitness level. The nutrition plan is simple and makes sense! Music—-it really does help and also covers up the groans!!" "I started attending the bootcamp at Innovative Fitness in April 2012. I started seeing results after attending the bootcamp for a couple of months so I decided to try personal training. I started training with Anthony Bales at the beginning of 2013. Since training with him my body fat has dropped almost 6% in just a few months. I am also able to complete the bootcamp more easily. Talking with some of my friends and their experience with trainers I feel that Anthony is very knowledgeable. He makes sure I am performing the exercises correctly and pushes me to my maximum. I know I would not be seeing the same results if I was just going to the gym and working out by myself. I enjoy the atmosphere at Innovative Fitness. All the employees have a great attitude which helps me have a good attitude and want to work harder." "Lost 35 lbs and 7 % bodyfat in 8 weeks and was a runner up in the 2012 transformation challenge." "Jeff lost 45 lbs and 9 % bodyfat in 8 weeks and was the winner of the 2012 Transformation Challenge!" "Ryan Carpenter lost 40 lbs and 8 % bodyfat in 8 weeks and is our 2012 transformation challenge winner." "Challenge results are in!!!! 6lbs & 6% body fat loss in 8 weeks!!! I ended at 19.8% body fat which was my goal!!! Thanks to my amazing trainer Jason & the IF team!!!" "It will be two years in September of 2013. TOTALLY POSITIVE – both my experience and my results. At age 47, I finally realized I wasn’t able to do a lot of the things I have always enjoyed doing. It was a hard fact to admit that. My wife, had been training at Innovative Fitness and asked me to go in for a consultation. Her words were, “What can it hurt? If you don’t like it, don’t go back”. I immediately identified with my trainer, and felt like I was in an atmosphere that I could be successful and comfortable. When asked what my goals were, I said, “Weight Loss, to regain some, Flexibility, and Agility”. I felt if I could accomplish the first the other two would follow. When I started, I was at my all time high weight of 238 pounds. In the first year, I lost 50 pounds, through following the prescribed meal plans, and attending my scheduled workouts twice a week. To say it has been easy isn’t accurate, but it has been much easier than I anticipated. If you follow the meal plans, and the trainer’s advice on exercise and activity, you WILL BE successful. For me, success has bred success, and I believe I’ve turned a corner, and made the “Lifestyle Adjustment” that I have heard others speak of. I couldn’t be more satisfied with the results I have experienced at Innovative. Since my low weight of 187, I have added 10 lbs. of lean mass, while slightly reducing my body fat percentage. I am not a “Gym” person, but Innovative isn’t a “gym”. Innovative has been as much a LEARNING CENTER for me, as it has been a gym. I have LEARNED to eat well, I have LEARNED to exercise and I have LEARNED to truly enjoy the results that eating well and exercising have given me. I enjoy the people I have met, the friends I have made, and the atmosphere that Innovative Fitness provides for me to be successful. Innovative Fitness is one of “My Places” a place where I feel comfortable, where I feel I belong, and where I see friends." I have been in various gyms but never had this type of combination exercise that lets me get flexible and strong at the same time,, thanks Jesse you are truly the best trainer I have ever been this fortunate to work with!!" Not to sound like a cliché, but my experience at Innovative Fitness has been life altering. I have lost 30 pounds and I feel like a different person. It has been a complete lifestyle change thanks to Dusty and the group at Innovative Fitness. The individual attention you get during the workouts and the way they helped me completely reinvent myself is an experience I would recommend to anyone. I enjoy the balance of professionalism and humor that Dusty puts into our workouts. Also, the variety of exercises keeps it from becoming tedious. The discussion about diet and nutrition has also been a game changer for me. It’s not a diet, it is a change in the way you eat. 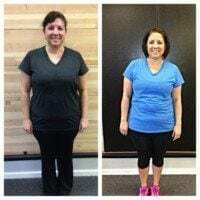 I thought that would be the hardest for me to change, but with the handouts showing the correct Proteins, Fats, and Carbs was also very helpful." One of my main objectives working with a personal trainer was to strengthen my shoulders due to rotator cuff surgeries in a safe environment. That is being accomplished with additional range of motion, improvement is continuing, strength is building. Additional benefits are core strength, balance and muscle tone. Patience is a key factor. I can’t wait to see more results with the excellent training and motivation from Mr. Anthony Bales! The knowledge that I’m doing something positive for my health, that with hard work and the encouragement from Anthony I’ll also see the changes outside, feel the changes inside!! I’m also impressed with the continued education that the trainers go through and how they implement that in their training sessions with their clients. The entire staff is a pleasure, very welcoming and encouraging!"